The utilitarian chair. Its simple structure and function haven’t changed in millennia. But researchers at Missouri University of Science and Technology have made the humble chair a portal into not only a person’s movements, but also their mental state. Dr. Debraj De, a postdoctoral fellow at Missouri S&T, and Dr. Sajal K. Das, the Daniel St. Clair Endowed Chair and department chair of computer science at Missouri S&T, have developed a chair that could help detect the daily behavior and mental health of elderly people at home or in assisted-living facilities — specifically rehabilitation patients and elderly people susceptible to levels of dementia. The “Care Chair” employs sensors to detect a user’s functional and emotion-based activities throughout a normal day. 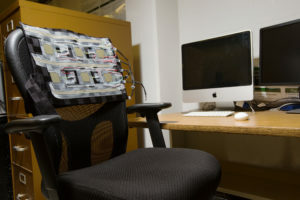 The device, which uses four sensors, slips over a chair’s backrest and back so that it’s unobtrusive. It uses the same principle as law enforcement interrogators or customs agents who detect micro facial expressions that last only a fraction of a second but can reveal a person’s true emotions. For the study, De had participants engage in 19 sedentary activities in the chair. De tested static activities like napping and sitting still; and movement-based activities like looking back left, looking back right, moving their head side to side, head nodding and waving hands. He also tested user-functional activities like talking, sneezing, coughing, drinking, eating and hiccups; and emotion-based activities like crying, laughing, shouting, weeping, yawning and yelling. Each activity activated the sensors in unique ways, giving the researchers a baseline for comparison. “To the best of our knowledge, this is the first time that user-functional activities and user-emotion-based activities are detected — in addition to static and movement-based sedentary activities and postures — using just four sensors on a chair backrest,” Das says. Working with Dr. Mignon Makos at Phelps County Regional Medical Center (PCRMC), the team is using the chair for sensing and data analytics designed for cognitive health assessment in elderly people who are prone to different levels of dementia, and in slowly rehabilitating patients with cognitive impairments, such as stroke and cancer survivors. On a wider scale, the Care Chair sensors could give doctors, nurses and home healthcare providers a better understanding of their patients’ activity level, which in turn could help determine the best level of care needed. The work is partially funded through a National Science Foundation I-Corps grant and a Missouri S&T innovation grant. And the work also is part of the Ozark Biomedical Initiative, a partnership between Missouri S&T and the hospital designed to promote collaboration in research and education and to facilitate the exchange of ideas. De presented the work in a paper titled “Care-Chair: Sedentary Activities and Health Assessment with Smart Sensing on Chair Backrest” at the 2016 SMARTCOMP conference in May in St. Louis. The paper has been invited for fast track publication in the Pervasive and Mobile Computing Journal; those selected for publication will be notified Jan. 10, 2017. Missouri S&T students Alec Bayliff, a graduate student in computer science from Springfield, Missouri; Adam Evans, a junior in computer science from Plano, Texas; and Rakesh Kumar, a former graduate student in computer science from Hazipur, India, also contributed to the project. Bayliff and Evans were part of the Research Experience for Undergraduate program, with Bayliff also participating in the Opportunities for Undergraduate Research Experiences (OURE) program. It also was part of Kumar’s master’s thesis defense. Nice work. Eldercare is such an important area. Great that you are working with the medical center.